For the most part, the organic keyword listings on Yahoo SERPs match up with Bing’s one-to-one, but we do see a few notable differences. 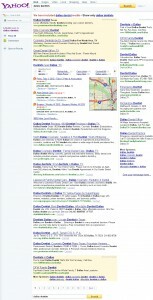 Thus far, we’re not seeing Microsoft PPC ads on Yahoo, and the local map results are different. Yahoo appears to have opted not to display Bing’s groups of related search results or the city-specific block block which can be found at the bottom of most Bing city SERPs. 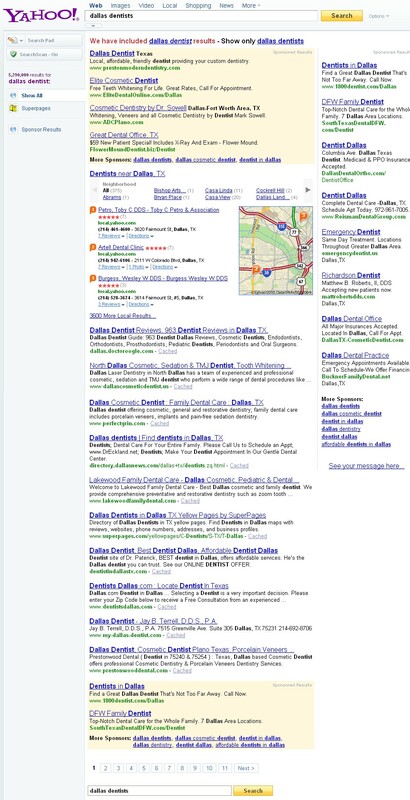 This is most obvious in the results for things like “Dallas, Texas.” This is good in the sense that Yahoo’s first page remains a set of ten results related to your keyword (as opposed to Bing, where page one may show only a Top 5). Meanwhile, Bing/Yahoo’s combined search share continues to rise, and many have been seeing ongoing increases in Bing referral traffic to their sites. With Bing search share rising, and their SERPs now being mirrored on Yahoo, the question prime on many marketers’ minds will be: What should I be doing for Bing SEO and Bing Local SEO?!? For some years now, the Microsoft/Bing (and even Yahoo!) SEO advice has pretty much been: “do what you do for Google, and it works pretty well for Yahoo and Bing”. This advice has held up pretty well, particularly on the general assumption that since Google’s marketshare is so large — we pretty well must aim for the greater target and pick up referrals from the lesser sources as a nice bonus where we can get them. However, as Yahoo and Bing search traffic combines, more focus is going to be placed upon differentiating factors between the Google/Bing search giants. Bing may show preference for shorter URLs. 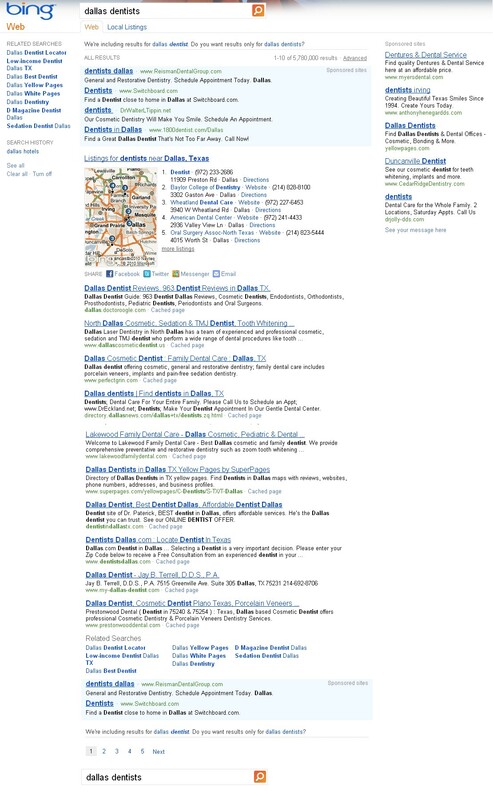 There’s a greater degree of duplication in Bing SERPs for local queries, in the sense that the same domain may be allowed to appear more than once in the same keyword SERP. Unsurprisingly, Google appears to be doing more to normalize URLs, trying to limit dupes caused by things like uppercase/lowercase variants of the same page from diluting out in the index. Bing may prefer to rank a website’s homepage more than deeper content. Rand’s “Google vs. Bing: Correlation Analysis of Ranking Elements” at SEOmoz and Aaron’s “Optimizing for Bing” post appear to have fairly solid observations which align with some of what we’re seeing as well. We’ll be further focusing upon Bing local ranking elements, and I might publish further observations in the near future. 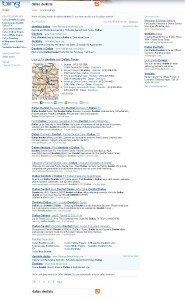 This entry was posted in bing, Local Search, SEO, Yahoo by Chris Silver Smith. Bookmark the permalink. I suppose this was always on the cards. I wonder when Yahoo’s going to start showing MS paid ads?